​1. Why do many historians consider England to be the focal point? 2. What were the important inventions which helped to create this change? 3. What is urbanization? What are the causes? 4. What were the positive and negative consequences of urbanization? 5. What environmental issues arose because of industrialization? 6. What social problems grew out of the industrial revolution and urbanization? 7. What were the problems with the working conditions? Industrial Revolution started in the 18th century and continued throughout the 19th century. 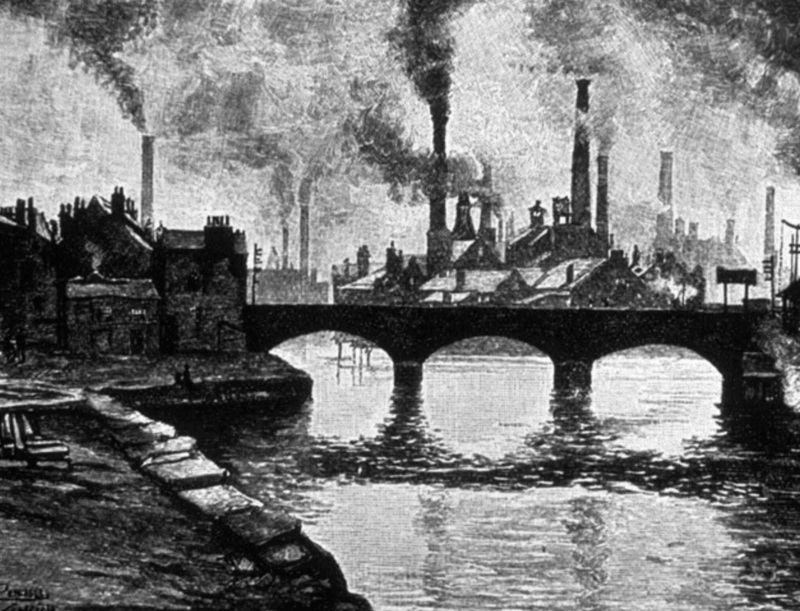 The Industrial Revolution started about 1750 in England, and then spread across the globe. Both revolutions were inspired by the same four general causes, and both saw the concept of rights evolve as citizens became more and more aware of the possibilities for their lives. The French Revolution was a step towards political equality, it was not focused on minimizing the huge gap between rich and poor. The Industrial Revolution - generated new ideas about the rights of working-class people, such as Marxism and socialism, which proposed a revolutionary redistribution of wealth. identify the causes of the Industrial Revolution, including new ideas and innovations. demonstrate an understanding of the impact of urbanization on society and the evolution of rights. compare and contrast one feature of the industrial period with a modern, evolving industrial society. WE ARE FOCUSING ON BRITAIN, but remember what John Green said in his video about Industrialization in other parts of the world. We are taking a Eurocentric view. Which means we are also taking an ethnocentric view. This is a BIAS! European nations competed, at times ruthlessly, for these colonial sources of power and exploited the resources and the indigenous peoples. Note that, while European nations thought of colonies as new regions or territories under their political and military control and settled by their people, colonies were established in territories where people already lived. growth of cities and factory work. growth of railways and the steam engine. growth of the working class as a unique group with their own concerns. the rise of the working class. the rise of working-class consciousness. a concern over social issues, such as crime, poverty and prohibition. We will examine the causes of the Industrial Revolution by looking at the four factors for revolution introduced earlier in the course: new ideas, social conflict, economic conditions and political factors. Some reformers began to advocate for a socialist system, in which society (usually in the form of the government) would own and control the means of production (factories, utilities, etc.) and allow the wealth to be distributed more equally among everyone. These early socialists were often called Utopian Socialists, as many (including Marx) saw their ideas as impractical. 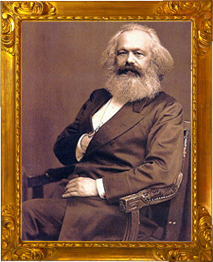 By far, the most influential socialist thinker and writer was Karl Marx. With Friedrich Engels, Marx published The Communist Manifesto in 1848. Marx believed that in a capitalist system where privately owned industries competed to make profits, workers would never receive better than survival wages. He saw society as divided into the owners of production and those who own their own labour (workers). He felt the workers needed to overthrow those in power. He predicted that class struggle would lead to a classless society in which society could own the means of production. While Marx's thoughts were influential, they were never put into practice in the way he intended. The concept of liberalism was also at work. Liberalism grew out of the ideas of the Enlightenment, and was based on the idea that people should be as free as possible from government interference. Liberalism promoted the basic rights of all people, including many personal freedoms; however, liberals of that time thought that the right to vote and hold office should only be open to men of property. Liberalism was especially attractive to the growing population of middle-class men who wanted voting rights for themselves. As the Industrial Revolution processed, people became increasingly aware that property meant power, and that those who had property had a greater opportunity to acquire more property. Those who did have the property (and therefore the power) were able to control government and society. Workers and the growing middle class increasingly looked for opportunities to become property owners themselves. The concept of property became an important one in spurring the revolution. poor working conditions (back-breaking labour, long hours, harsh treatment, repetitive work). Practice analyzing images to gather information about these living conditions. You can learn more from images if you look at them systematically. Look at the background, middle ground, and foreground separately. Make individual observations. What does the picture tell us about conditions in urban England? Remember, it's important to be critical when examining evidence. Any argument made from analyzing evidence must be checked against other sources—you must investigate and ask good questions about the source.Who created this? When? Why did they create it? Is it accurate? Keep these questions in mind as you view evidence examples in this module and throughout this course. Shepherd's Buildings comprised two rows of houses with a street seven yards wide between them. Each row consists of two lines of houses back-to-back... There is one outside toilet for each row (22 houses and 11 cellars)... Each house contains two rooms, a common room, and a bedroom above it; each room is three yards square. In a typical house there are nine people belonging to the same family, and the mother about to give birth to a tenth. There are 44 houses in the two rows and 22 cellars all the same size. The people who could not afford, or find, a room lived in the cellars and courtyards. In 1850, 15,000 people lived in cellars in Manchester; in Liverpool, 39,000 people lived in 7,800 cellars and 86,000 in 2,400 courtyards. The houses are occupied from cellar to garret, filthy within and without, and their appearance is such that no human being could possibly wish to live in them. But all this is nothing in comparison with the dwellings in the narrow courts and alleys between the streets, entered by covered passages between the houses, in which the filth and tottering ruin surpass all description. Scarcely a whole window-pane can be found, the walls are crumbling, door-posts and window-frames loose and broken, doors of old boards nailed together, or altogether wanting in this thieves quarter, where no doors are needed, there being nothing to steal. Heaps of garbage and ashes lie in all directions, and the foul liquids emptied before the doors gather in stinking pools. Here live the poorest of the poor, the worst paid workers with thieves and the victims of prostitution indiscriminately huddled together, the majority Irish, or of Irish extraction, and those who have not yet sunk in the whirlpool of moral ruin which surrounds them, sinking daily deeper, losing daily more and more of their power to resist the demoralizing influence of want, filth, and evil surroundings. A new industrial middle class grew from those who built the factories, bought the new machines and developed the markets. They were joined by professionals, such as doctors and lawyers, whose comfortable incomes allowed them access to material goods. At the same time, an industrial working class was created by a growing demand for labour in the factories, mines and mills. As urban populations grew, the conditions this group faced gave them a very different view of industrialization than how their middle-class counterparts saw things. The very different views of the wealthy upper class, the growing middle class, and the workers of the industrial period inevitably led to class struggle. Their conflicting interests (profit and wealth vs. working and living conditions) were in opposition to each other and created conflict. Globalization, was just beginning. Britain had a vast colonial empire, and ships that could transport goods all over the world. Improvements in farming technologies meant that fewer people were needed to work on farms as they were replaced with machines. This in turn led to migration by rural families to the cities to look for factory work. Mine owners also benefited from this labour source to mine the coal needed to run the steam engines. Improvements in transportation brought about by the steam engine and metals manufacturing resulted in an expanded market for the sale of factory-manufactured goods. This increased the wealth ofmanufacturers and industrialists (a new, wealthy social class) and increased their available capital (money) to invest in more factories and machines. In the early days of the Industrial period, the government practiced the policy of laissez-faire, under which factory and mine owners were mostly left unregulated. This mean that the terrible working conditions for the workers were often unaddressed. The conditions for the working class led to a call for political change. Utilitarians, led by British economist and thinker Jeremy Bentham, advocated that all laws or actions of government should be judged by their utility (their practical use to society). Their goal was to have the greatest happiness for the greatest number. To Bentham, this meant as much individual freedom as possible, with minimal interference. His ideas influenced others, such as John Stuart Mill, who agreed that individual freedom was important, although not at the expense of the lives of workers. Socialist thinkers Marx and Engels expressed their belief that that eventually a classless society would exist. Their ideas were picked up by political parties in a number of countries. Other groups formed socialist parties based on the ideas of Marx, but without the call for a revolutionary approach. They instead believed that workers could work within the current system to gain reforms. Trade or labour unions were another force working for change within the system. Many workers, recognizing the power in numbers, began to organize themselves into unions and force employers to recognize the right of unions to bargain collectively for their members. This movement also used the right to strike to pressure employers to make improvements for workers. The Enclosure Acts (also spelled: Inclosure Acts) closed off traditional public lands left over from feudal times by an action of the British Parliament. Many small farmers who depended on using public lands to make their livelihood by gathering hay, grazing their animals, or growing crops, were no longer permitted to use public lands. Many were forced to move into urban centres to support their families. The Corn Laws were introduced by the British Parliament between 1815 and 1846. These laws were intended to protect the profits of wealthy grain-growing British landowners by imposing steep import duties on grain brought in from other countries. Because of the Corn Laws, the price of bread (the most important food staple) remained high, even in times of famine. The British policy of maintaining overseas colonies resulted in worldwide markets for the sale of manufactured goods. Britain's large navy was used to ship British-made goods all around the world. Calls for ReformThe harsh working and living conditions in the cities led many people of influence to demand changes in the law to make things better for working people. Some influential people believed that government should not interfere in the free operation of the economy. They argued for a laissez-faire economy, in which government should have the least possible influence over business. As always, arguments and disputes arose over demands for change. After the Peterloo Massacre , the government's immediate response was an attempt to stop reform efforts and public unrest with the passing of what became known as The Six Acts. A conspiracy existed for the subversion of the constitution in church and state, and of the rights of property... He should now describe the measures designed to meet this evil... It was proposed, that any person having been tried, convicted and punished for a blasphemous or seditious libel, should on conviction of a second offence, be liable ... to fine, imprisonment, banishment, or transportation ... [and] that all publications, consisting of less than a given number of sheets, should be subjected to a duty equal to that paid by newspapers. Factory ActsOver a number of years, government gradually changed the laws to protect workers. They started with the textile industry—the industry that grew first and fastest. Gradually, the protections were extended to other industries. Those most easily exploited—women and children—were the first to get at least some protection from overwork and unsafe conditions. Over the course of the 19th century, the British parliament passed a series of Factory Acts to regulate hours, ages and conditions of work. Notice the dates for each and the protections they provided. You may notice that the progress was slow and limited. Factory Act of 1802 - Apprentices in the textile industry shall work no more than 12 hours a day between 6 am and 9 pm. Factory Act of 1819 – No children under 9 shall work in textile mills. Those 9 to 16 shall work no more than 72 hours a week with 1 ½ hours for meals each day. Factory Act of 1833 - Working hours in the textile industry will be between 5:30 a.m. and 8:30 p.m. 13-18 year olds shall not work more than 12 hours a day with 1 ½ hours for meals; 9-13 year olds may work a maximum of 9 hours a day and 48 hours a week. No one under 18 may work at night. Factory Act of 1844 – In textile factories, children between 8 and 13 shall work no more than 6 ½ hours a day, either in the morning or afternoon. 13-18 year olds and women shall not work more than 12 hours (with 1 ½ hours for meals) Monday to Friday and no more than 9 hours on Saturday. Factory Act of 1847 – No women or young person in the textile industry shall work more than 58 hours per week, an average of slightly less than 10 hours per work day. Factory Act of 1850 – Women and young persons working in the textile industry shall start no earlier than 6 a.m. and work no later than 6 p.m. in summer and 7 a.m. and 7 p.m. in winter. Work shall stop at 2 pm on Saturdays. Factory Act 1867 and the Workshops Regulation Act 1867 – The laws on working hours for children, young people and women will apply to all industries and workshops. Factory Act of 1874 – The work day for textile factories shall be reduced by ½ hour. Factory Act of 1878 – No child under 10 shall be employed. 10-14 year olds may work only half-days. Women may work no more than 56 hours per week. 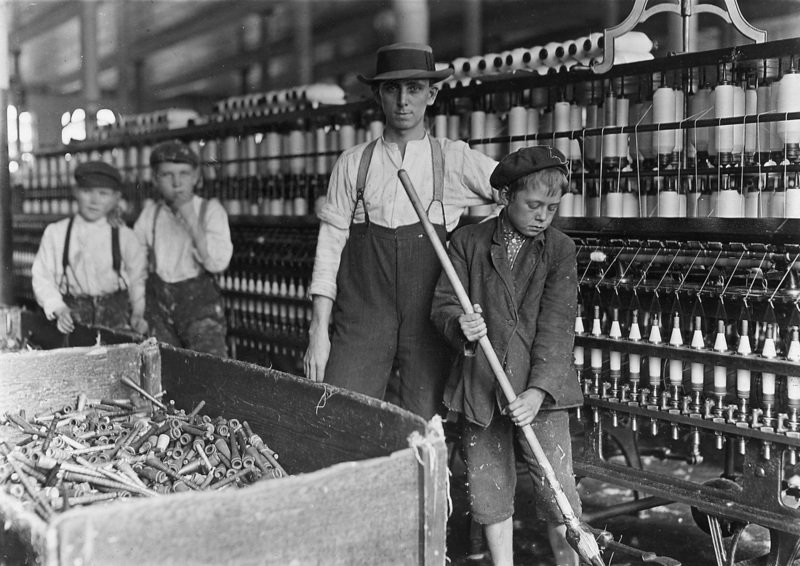 Factory Act of 1891 – The minimum age for children to start work shall be 11 instead of 10. The changes to working conditions were slow, and the desire for change gave rise to a number of political movements during the 19th century. In Britain, unions were made fully legal in 1871. In 1876, British unions gained real strength when they were given the right to strike. In 1867, the right to vote was given to almost all skilled workers. With the support of their members, unions often supported political parties and made some gains for workers' rights. In 1900, the British Labour Party was formed. As Labour Party members were elected to Parliament, the party gained influence in government. ASSIGNMENT QUESTION: In your opinion, do current New Brunswick employment restrictions provide enough protection for NB children and young persons, or are they too restrictive? Why? 2) Using your knowledge of the labour regulations of the past and our understanding of the needs of young people today, do our labour regulations do enough? Assignment: Urbanization ImpactYour major assignment for the Industrial Revolution section of this module is to create a multimedia presentation that shows the immediate (short-term) and long-term impact on society from urbanization during the Industrial Revolution. Your presentation can be in the form of a PowerPoint, video, photo story, mind map, prezi or another format of your choice that is approved by your online teacher. Remember to consult the rubric to guide your work and to help you make sure you are not missing anything! The Industrial Revolution Continues...Some historians believe the Industrial Revolution continues into the present day. We see it in the evolution of rights, the impact on the environment, continued globalization and outsourcing to other nations. Countries around the world (and even regions within our own country) with developing economies continue to face the challenges of a quickly growing economy, including housing issues, a shortage of trained labour and poor working conditions. Rights have continue to evolve as we move through time. Workers and individuals today continue to make progress in improving working conditions and increasing personal rights. Documents like the Universal Declaration of Rights and Freedoms and the Canadian Charter of Rights protect the rights of all. Collective bargaining agreements and government legislation also protects citizens' rights.